Kaveh Safavi is the managing director of Accenture’s health business. Whether activity trackers, smartwatches or sensors, wearables have made fitness and wellness an always-on activity among consumers. But a disconnect exists between an “always-on” approach and the brick and mortar that is the doctor and patient relationship. A rise in digital health solutions has the potential to alter the nature of the doctor-patient dynamic through increasing virtual treatment, self-care and engagement. An estimated $2.8 billion was used to fund digital health startups last year, and an even bigger influx of startup cash is emerging in this area. 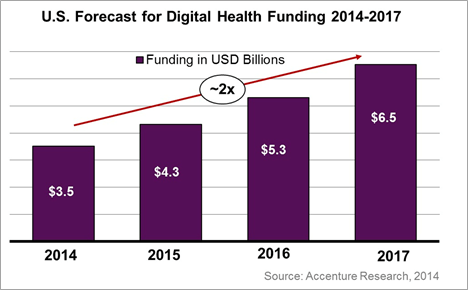 Accenture estimates that funding for digital health solutions will double in the U.S. over the next three years, growing from $3.5 billion in value to $6.5 billion by the end of 2017. This rapid growth will ultimately alter the way patients interact with the healthcare system and their own healthcare. Treatment, which includes personalized medicine, virtual care, telehealth and care coordination, has garnered $2.6 billion in new startup funding as entrepreneurs realize the role these technologies will play in patient care. Similarly, diagnosis has captured $2.1 billion in funding, representing a rapidly growing segment of clinical and consumer tools that provides insights, such as remote monitoring. Teladoc exemplifies this trend. The startup raised $50 million in 2014. Its U.S. board-certified doctors can resolve many of patients’ medical issues, 24/7/365, via phone or online video consults from wherever the patient is. “It’s health care on your terms – simple as that.” And it’s a far cry from sitting in a white-washed doctor’s office and waiting for the receptionist to call your name. Wearables, incentive programs and other patient-engagement solutions that target behavioral change received $2.6 billion in funding. The ability to link products, such as wearables, with services like clinical advice lines will broaden the scope of healthcare delivery. In fact, a study by ABI estimates that 42 million wearable fitness and health devices will be shipped in 2014, up from 32 million in 2013. Although wearables have faced some challenges in relation to technical accuracy, battery life and activity tracking, new technology and devices are beginning to change that. For example, “hearables” – smart ear devices with 3D audio notification — may prove a more accurate, less obtrusive sub-sector for capturing fitness and cardiovascular activity. Proximity to blood vessels within the ear mean that products, such as Valencell’s heart rate earphones, allow users to precisely and continuously measure weak blood flow signals during extreme physical activity. This provides an accurate picture of heart rate, respiration rate, and other blood flow parameters, while allowing individuals to still listen to music or audio. These sensor-enabled devices give objects the power of perception — into conditions such as temperature, motion, chemistry and usage — but they’ll fail to become more than single-function devices without a connected infrastructure. For example, Apple’s HealthKit is an early example of a platform enabling health and fitness applications to work together and convert data into a healthcare data ecosystem now occupied by caregivers, insurers and pharmaceutical companies. Ideally, this allows consumers to choose the information source and device while creating a new layer of data that can bring about profound behavioral change in users. The patient experience will be different in the not-too-distant future. Traditional healthcare organizations must develop ways to be relevant to the new health consumer, by encouraging and embracing, rather than resisting, digital healthcare startups and their disruptive ideas. Strategies may include establishing external R&D arms (e.g. ventures and accelerators), acquiring startups for talent or implementing novel investment models. Healthcare leaders will also need to modify business objectives, while establishing structures to efficiently and effectively identify, test and prove clinical applications. Finally, all stakeholders will face increased pressure to cultivate a diverse ecosystem of partnerships and alliances.